This Phantasmat Walkthrough has everything you need to help you find your way out of the mystery of Phantasmat. The guide walks you through all the levels and provides images when you can't find those extremely hidden objects. Overview: You are lost in the middle of nowhere when you crash your car. You stumble upon a strange village. 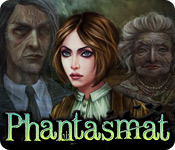 Can you solve the mystery of Phantasmat? Hidden Object & Match-3: When you are in hidden object mode, you will notice a "switch to Match-3" at the top. By doing so, you can play a match-3 game. When certain objects are cleared from he board, it will automatically find hidden objects on your list. This is a great feature if you are stuck and have no hint handy. Hidden object areas are triggered by an event. Condeminion Logos: There are three hidden game developer logos in the game. You get awarded for finding them. Hints: This are unlimited, but must "recharge." Tasks: You task list is located to the left of your inventory. Click it to get helpful hints on what you need to do next.